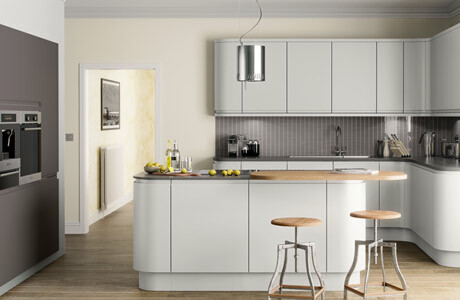 Handleless kitchens are slick, elegant & popular due to their streamlined appearance. 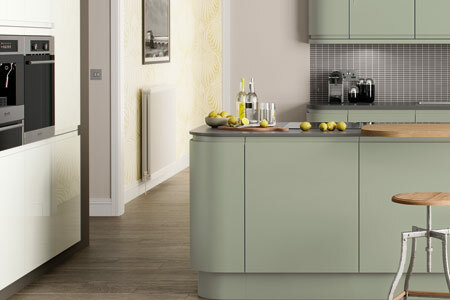 There are two main types of handleless kitchen designs. True handleless design is created using an aluminum finger rail which is routed into the kitchen cabinets. This is a more premium and luxurious handleless design. The other design is J-groove handleless kitchen door which created using slab door with recessed J shape on top of the door which allows us to open door without need for any handle. 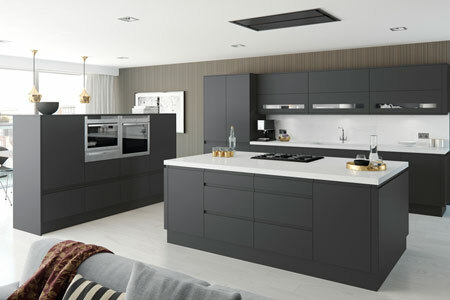 The main benefits of handleless kitchens is ease of maintenance as you can just swipe down the door front without needing to work around the handle. 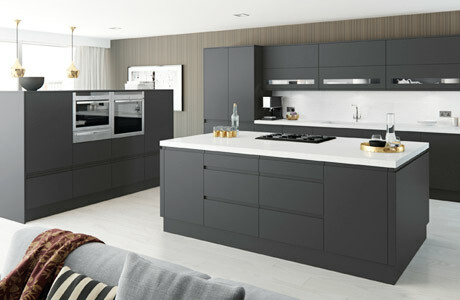 Castor is our true handleless Germany style kitchen range. Available in both high gloss and matt finishes. 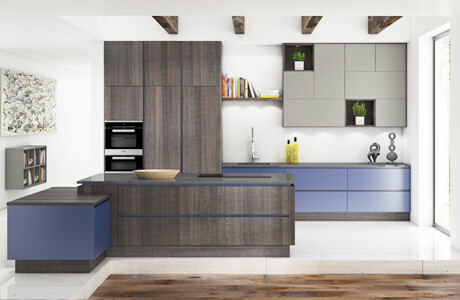 One of our most popular kitchen collections featuring colours such as white, graphite, cashmere & porcelain. 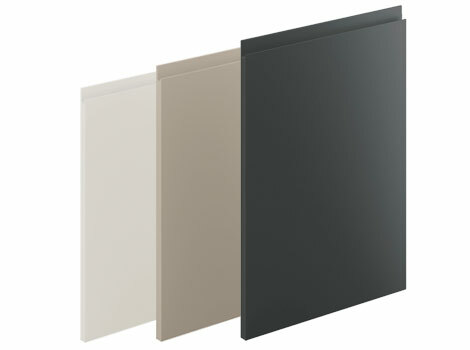 Choose from matt white, aluminium or dark grey aluminium kitchen door profiles. German style kitchen at sensible price. Ideal for your new kitchen or housing developments. Lyra is our true handleless kitchen range. True handleless style is achieved using a colour coded aluminum rail which is routed into the kitchen cabinets. By inserting an aluminum finger rail into the cabinets, space is created for you to place your fingers behind the doors in order to open them. Considered as the most versatile true handleless range in the UK market, our Lyra has over 50 base variations where you can choose from solid, metallic, wooden designs in several different finishes. Orion is our matt handleless kitchen range. 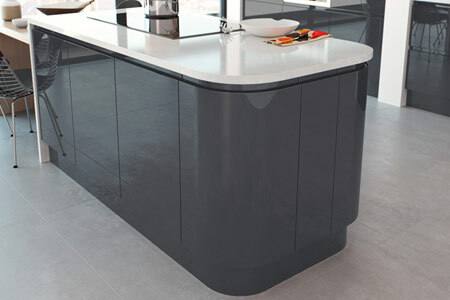 Handleless style is created using a slab door with a J-shaped groove on the top. This type of door creates a minimal handleless look with clear contemporary lines. Hand painted door creates a beautiful matt finish that ensures your new kitchen is modern and elegant. Available in four beautiful matt colours. Carmel is our hand painted matt handleless kitchen collection. Bespoke made kitchen doors which are hand painted in Italy in any colour of your choice. Hand painted kitchen door which uses several layers of matt lacquer to create a beautiful matt finish. Thick 22mm door offers an air of simplicity, creating the perfect contemporary kitchen in any home. Scorpion is our high gloss handleless kitchen collection. 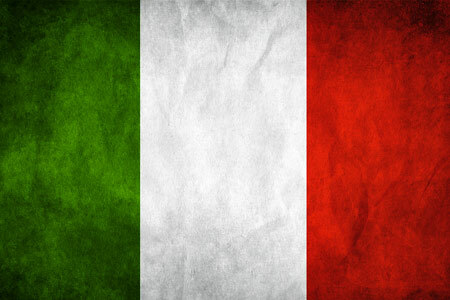 Manufactured and hand painted in Italy with a selection of 7 contemporary colours which are fully stocked in the UK. High gloss handleless kitchens are very easy to clean and maintain. Creating almost mirrored reflection, high gloss handleless kitchens add certain depth to your kitchen space. One of the best selling kitchen types in the UK market. 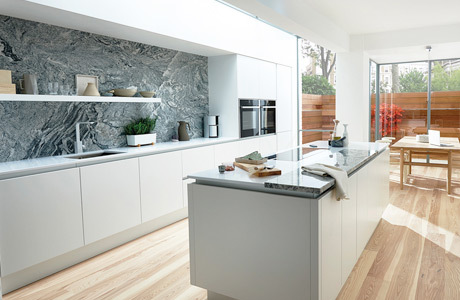 Why choose our Handleless Kitchens? Made in Italy, our handleless kitchen collection features both bespoke made to measure ranges and stocked ranges. We not only follow the latest fashion trends but we create them too. With an unlimited set of colours, designs and features our handleless ranges are perfect for your home. 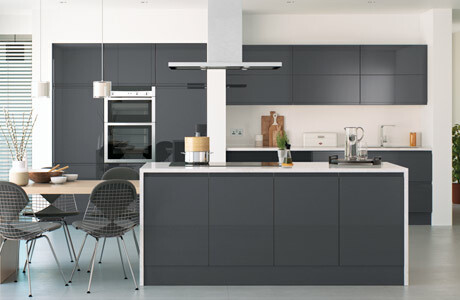 Looking to purchase handleless kitchen doors online? We have a wide selection of both stocked and made to size handleless doors. Made in Italy but stocked in UK, our handleless kitchen door collection is contemporary and stylish. Available in an unlimited choice of colours or if you’re looking for something a little bit different we provide a colour matching and paint to order service.